CD 2: Bruckner: Symphony No.4 "Romantic"
Both orchestras play beautifully . . . [the First] is in my mind one of his better late recordings, and certainly reflects a lifetime of love for this particular work. The other unquestionable standout is the Fifth, which features an unusually excitable Abbado presiding over an unusually energized Vienna Philharmonic . . . the music making is unquestionably great in] this beautifully soft-grained performance . . . [the Seventh (with no small credit going to the orchestra) is a] gorgeous reading, with the strings and winds really singing . 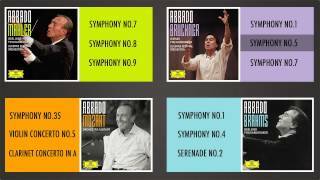 . . What we have here is a fine set for Abbado's many fans . . . the First, Fifth and Seventh all have insights and beauty worth hearing.